The Royal Canadian Mint has issued a new four-coin set which placed together depicts Canada’s national symbol, the maple leaf. When the four square-shaped 2017-dated coins are positioned side-by-side in a greater square, they form an exquisitely engraved image of the Canadian icon. The coins are designed by Canadian artist Celia Godkin and feature a highly detailed engraving of of the sugar maple leaf, or Acer saccharum, as it would appear in a natural setting. From the leaf’s wavy edges to the veins that run through each lobe, the fine details infuse this design with a life-like sense of dimension and texture. The four reverse images combine to form the image of a complete maple leaf. 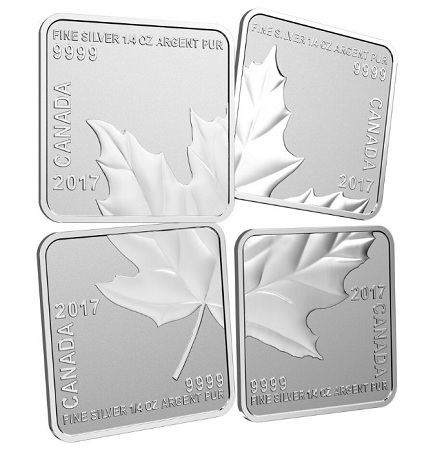 Also engraved on the reverse are the purity, FINE SILVER 1/4 OZ ARGENT PUR 9999, the word CANADA, and the year, 2017. The obverse features the face value, 3 DOLLARS, and the effigy of Her Majesty Queen Elizabeth by Susanna Blunt. Each piece is considered a separate coin. All four coins are presented and packaged as one product or complete set and are encapsulated in a Royal Canadian Mint-branded clamshell case with a graphic outer protective box. For more information on these and other coins offered by the Royal Canadian Mint, please visit their Web site. International orders will be dispatched where applicable. Product is fairly attractive and unique but the price is very unattractive. It comes across as if profit and profit alone is the driving force behind it.